French Technologist Vincent Loubiere from aircraft manufacturer Airbus talked about prototyping to improve aircraft developing and manufacturing. He explained how, through a digital fabrication department, they are solving technical problems more rapidly than usual in this field, where the development of solutions can take years of work. Currently, he is in charge within Airbus of the development of Digital Materials and Structures, in collaboration with MIT’s Center for Bits and Atoms. He also made a call to makers to collaborate on the discovering and developing of new solutions for aircraft industry. 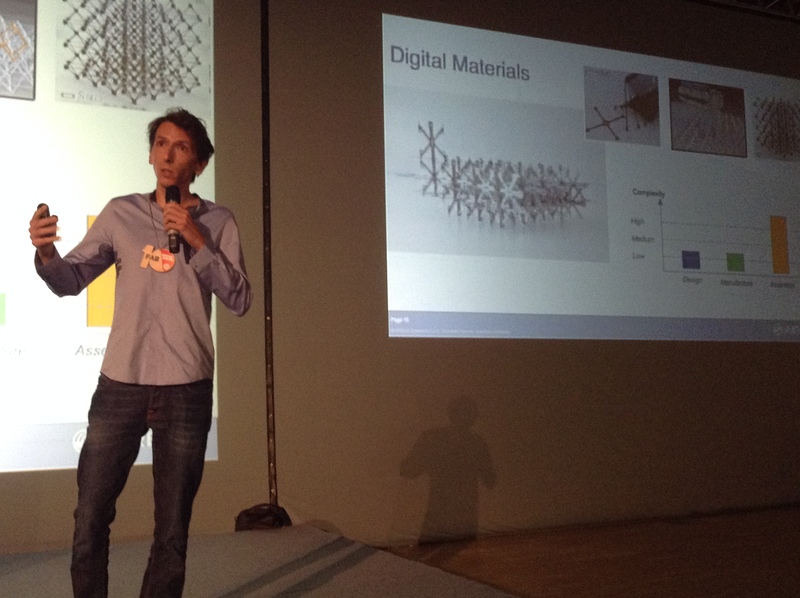 Particularly, the digital fabrication of new materials to achieve lighter and faster aircrafts. 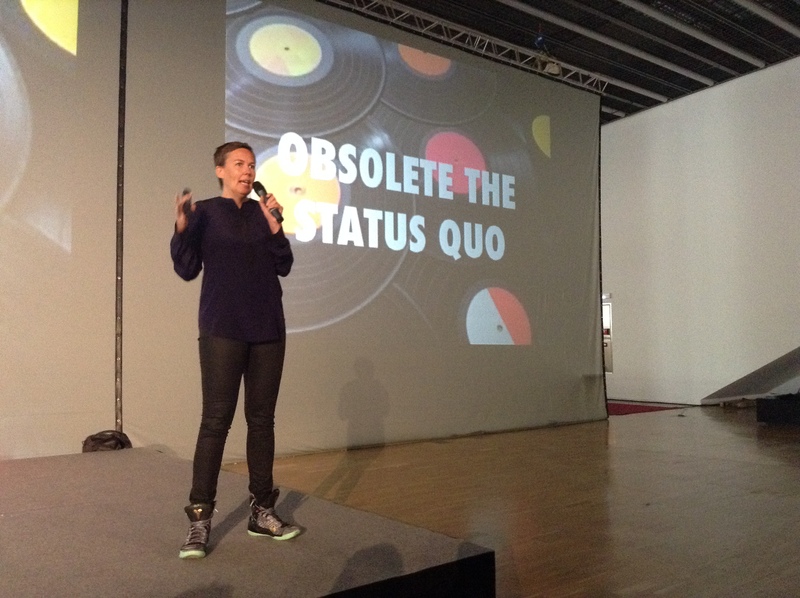 Another highlight was the talk given by Hannah Jones from sport equipment manufacturer Nike. She delivered an impressive speech on the importance of new materials and innovation for environmental conservation and sustainability. As a leader of sustainability strategy and innovation at Nike, she told us how analyzing their factories, they realized the huge amounts of waste they produce, throwing away up to one billion dollars in that way. Currently, they are researching how to recycle the waste of their factories to develop new materials of it. Waste can be the new gold, she said, and our future will depend on it. 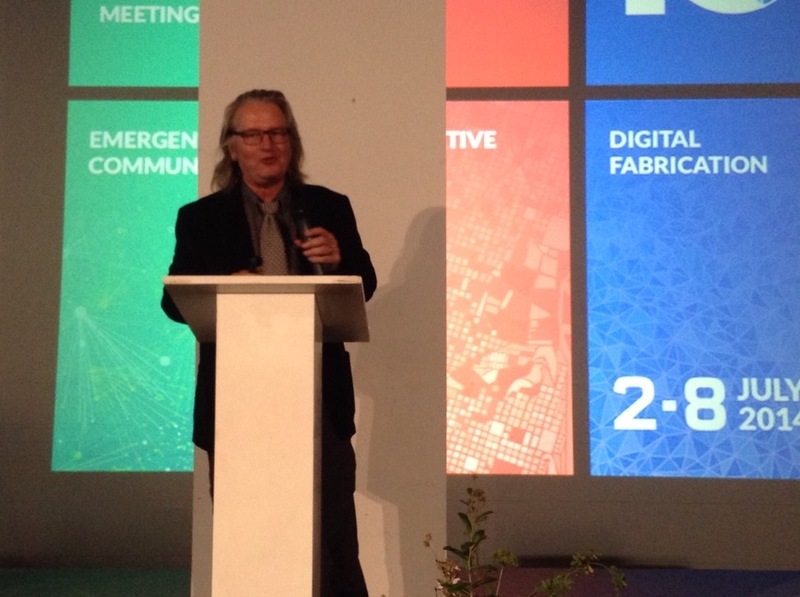 After the lunch, the witty, intense, emotional talk of American science fiction author and forward thinker Bruce Sterling was one of the climax of the whole event. It met all the expectations. Sharply putting in context the smart cities hype, he explained how, if smart cities are born from commercial interests of big corporations and not from the citizens themselves, their well-being and quality of life can be put in danger, as their ability for self management will be weakened. He solidly backed his ideas with examples of misleading advertising, charts and statistical data. He also asked us to look behind “the beautiful facades”, forecasting an “epic struggle” in 3 years. Some sharp phrases during his speech were: “No one wants to be a dumb city” or “Where is the chart of the dead companies of the third industrial revolution?”. Specifically addressing to citizens of Barcelona, Sterling advised us to be aware and not sell our “beautiful city” to corporations who are merely putting a mirage in front of us. Smart cities can only be built on hard strength and deep knowledge, and he encouraged us to learn from historical examples to achieve a successful town. A rapturing, overwhelming talk that left everyone amazed. Economic and social theorist Jeremy Rifkin participated via teleconference, discussing the main issues of his new book “The Zero Marginal Cost Society“. He pointed out Internet of Things, an ubiquitous Internet connecting everything with everyone, as an important agent driving us to that kind of society. He also explained how from the democratization of means of production that digital fabrication implies, new ways of social organization are coming up, disrupting the current structures of our consumer society. To the extent that it will not be so necessary to buy so many foreign-made goods, self-sufficient societies will be possible. Moreover, the third industrial revolution, which is a concept coined by himself, can lead us to a less energy dependent society. Professor Thorsteinn Ingi Sigfusson, Head of the Innovation Center Iceland, talked about the impact that Fab Lab movement has had on the rebuilding of Iceland economy after its economic crash in 2008. They are achieving to get out of their economic crisis by innovating, having Fab Labs a key role in this process as centers of innovation. “Fab Labs hit us like a comet”, he said, providing them not only with new ways of fabrication but also with new models of economic development, more based on local production. Being Iceland a small far-off country very dependent on imported goods, to be able to produce themselves is crucial to their future. 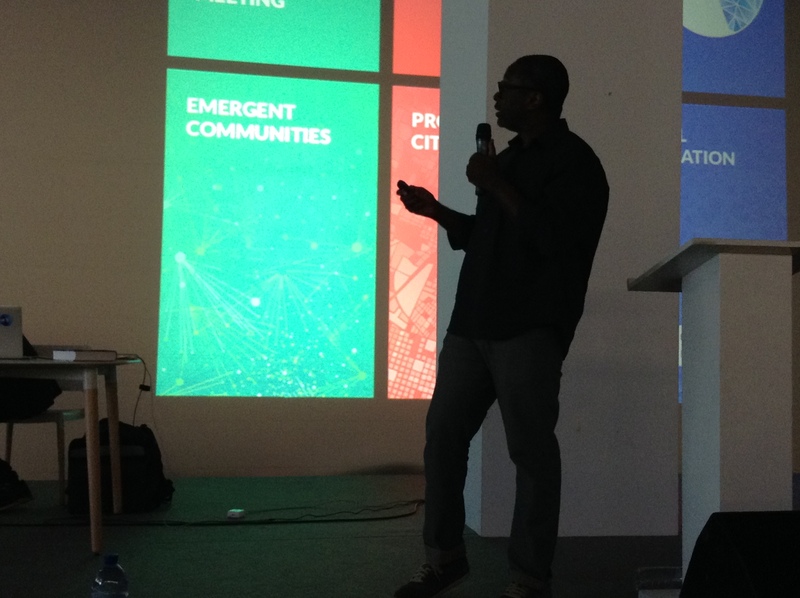 Getting close to the end of the event, Maker Faire Africa co-founder Emeka Okafor announced the next great African maker meet-up, taking place this year from 3rd to 6th September in Johannesburg, South Africa. Previous editions of these Maker Faires have been successfully held in Accra, Nairobi, Cairo and Lagos. Chief Architect of Barcelona City Council Vicente Guallart explained some of his goals for the city on the coming years — specially, having a Fab Lab in every District. Finally, Xavier Trias, Major of Barcelona, closed the event making references to the industrial past of the city and promising to make Barcelona one of the first fab cities in the world. So countdown has begun: Fab 10 has been the starting point for many commitments, initiatives and projects. An amazing gathering of talented people and forward-thinking ideologists, Fab 10 has marked an important milestone on the path to the Third Industrial Revolution. From the success of it all, we will infer the achievement of its goals. We will follow the path attentively. P.S. : We will publish interviews with Neil Gershenfeld, Tomas Diez and Bruce Sterling soon.